One of the best easy care landscaping ferns, Polystichum proliferum is commonly called the Mother Shield Fern. It naturally forms a neat rosette of tall fronds and grows well in a shaded position in a humus rich soil. It is not subject to many insect pests, requires little care others than a tidy up of old foliage and is suited to growing in pots and containers. 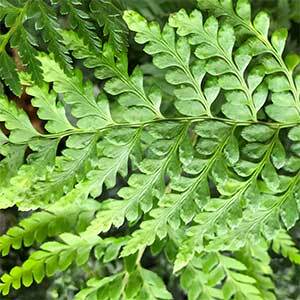 Well suited for use a feature plant in the garden, or for mass planting, if you prepare the soil well this is a very easy care fern. Dig in good amounts of compost before planting. Mulch around the fern to maintain a cool moist root run. Prune back old growth in winter as it dies back. Propagation is from spores or from the bulbils it forms on the fronds. Origins – Australia – East Coast. Spread To around Clumping to around .3 metres. Position – Part shade to dappled light.